Still looking for the perfect HDR monitor/recorder for your DSLR or mirrorless camera? Atomos’ latest release could be an option worth considering. The latest in the company’s popular Ninja series of portable monitor/recorder offerings, the Ninja V promises to be the perfect solution that offers advanced features in a sleek and compact design. Weighing just over 11 ounces (320g) and measuring 5.2 inches, the new portable HDR monitor/recorder also has a color-accurate display with AtomHDR and an output of 1000nits, making it easy for users to clearly see their images in daylight. Ninja V also provides critical monitoring tools such as histogram, false color, peaking, waveform and many others. Melbourne, Australia – 9 April 2018 – The latest incarnation of the famous Atomos Ninja line is here. 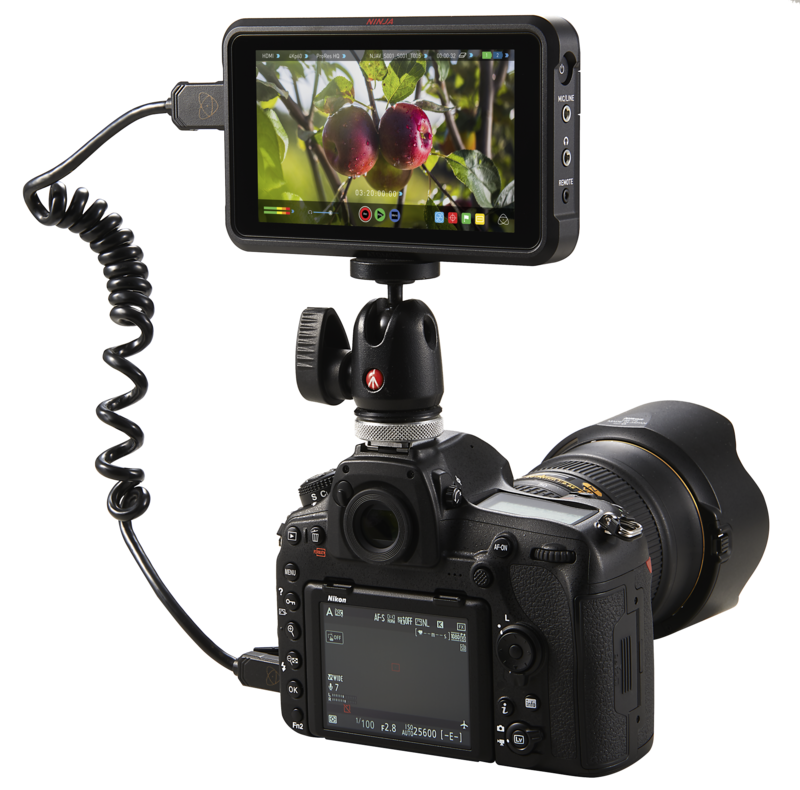 Seven years after the world’s most popular portable Apple ProRes recorders burst onto the scene, Atomos is delighted to introduce Ninja V – an all-new compact 5.2″ 1000nit high bright HDR monitor/recorder with unrivaled advanced features. It has a sleek modern design and weighs just over 11oz (320g) – perfect for mirrorless cameras, DSLRs and gaming. The near edge-to-edge high bright 5.2 inch screen has a stunning 1000nits of output coupled with an anti-reflection finish – allowing users to clearly see their images even in daylight. Use the color-accurate display with AtomHDR to see in High Dynamic Range, or load creative LUTs at the touch of a button. Ninja V gives you all the critical monitoring tools you need – histogram, false color, peaking, movable 1-1 and 2-1 pixel magnification, waveform, RGB parade, Vector scope, 8ch audio level meters and more! Record up to 4Kp60 10-bit video over HDMI 2.0 in edit-ready Apple ProRes or Avid DNxHR direct to affordable SSD drives. The Ninja V’s sleek 1″ (2.5cm) deep aluminium body is crafted for maximum portability and durability, stealthily attaching to any camera. A truly beautiful design. The AtomHDR engine ensures perfect exposures when shooting HDR. It delivers a stunning 10+ stops of dynamic range to the LCD in real time from Log/ PQ/HLG camera signals. Playout Log as PQ or HLG to a larger HDR-compatible screen. The display can be calibrated to maintain perfect color accuracy over time. Record direct from your camera’s sensor and bypass the internal compression quality and recording time limits. It runs from a single Sony-type battery for hours. The new compact AtomX Drive SSD offer robust affordable storage. Available from Angelbird, G-Technology and now also Sony Storage Media Solutions, who join as our newest licensed drive partner. Ninja V also works with Master Caddy II. Atomos HDMI control protocols allow recording to be automatically triggered, timecode matched and HDR metadata set by a wide variety of cameras. Realtime Log-to-HDR profiles allow users to take away the exposure guesswork in HDR production. Audio can be input directly from the camera digitally via HDMI, or fed in analogue via a stereo 3.5mm line/mic socket – especially useful for cameras that do not have a mic input. Enhance the capabilities of the Ninja V through the ingenious modular expansion slot breaking out connectivity for high speed video, audio and power. Expansion modules will dock onto the battery slot of the unit and offer advanced features such as continuous power modules. Atomos and third party accessories will be available in the future. Come and see Ninja V for yourself at NAB 2018, Atomos booth C9425.